The Tecno Boom J8 is finally here. It was launched at a fun filled affair at Nairobi’s Garden City mall on April 2nd 2016, where dancers entertained guests and models showcased the new device, with a number of people getting goodie bags with the device and other Tecno products. Away from that, we are excited for the new Tecno Boom device and there are a couple of upgrades we expect to see on it as compared to last year’s Tecno Boom J7. This year’s iteration of the Boom device is no different from the previous model as it is still meant to appeal to music lovers who want the device to deliver some awesome sound. Aside from that similarity, their differences are obvious, and hopefully for the best. Right out of the box, you get to see that there is a huge upgrade in terms of design. If at all last year’s Boom J7 was termed beautiful, I am not sure what we would call the Boom J8. All I can say is that it received a much appreciated facelift resulting in a clean, modern and minimalistic design that looks very pleasing to the eye. Another thing that you will notice as you get this device is that with every purchase of the Tecno Boom J8, you will also get Boom headphones. Last year’s J7 came with some well-designed earphones with a pretty pouch to store them. Not too much could be said about their quality. They were simple and satisfactory. 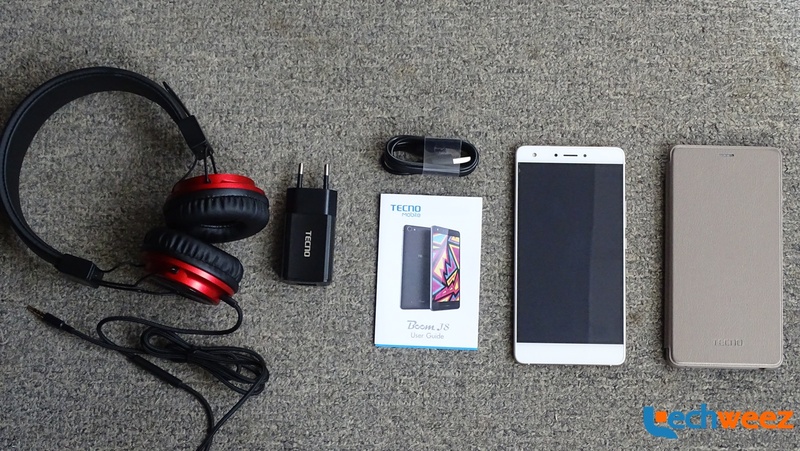 This time, Tecno has forgone the earphone and instead are giving out the Boom headphones and sadly no storing pouch. I cannot say much about the quality as yet but I think they might just sound the same as the previous earphones. We will keep you updated on that later on. You can also expect a revamp of the Boom Player on the Boom J8, version 2.1. Basically the Boom player is how Tecno attempts to merge the hardware and software to provide an outright music experience to its users. You can stream music from different genres and also download the ones you like to your device. The Boom player on the Boom J7 was okay but suffered by having limited selection of music, mostly Nigerian music and taking way too long to update top music charts. I hope this version of the Boom Player fixes those issues. The Tecno Boom J8 will also come running Tecno’s new user interface design, HiOS with hopes of having a more streamlined experience across all other Tecno devices. This is still a new experience so we will give you a more detailed account about HiOS as we continue to use the device so that you can get to know it better. More specifications of the device include an upgraded camera set with 13MP at the back and a 5MP selfie camera. It has a 5.5 inch 720p HD display, with 320ppi, resulting in a brilliant screen. It is running Android 5.1 Lollipop with Tecno’s HiOS on top, Maxx Audio speakers and an upgraded battery at 3000mAh. It also has 16GB internal storage which is expandable up to 128GB with 2GB RAM. It is retailing at Kshs 17000, a few thousands more than the price the Boom J7 when it launched which we hope is a good deal with all the upgrades the device has received. With more usage, we will be sure to come to a conclusion soon. Check out the unboxing and first look video we made of the Tecno Boom J8 as we use the device over the next couple of weeks in order to give you a detailed review. Great review. Kudos for having an unboxing video, was wondering why our tech blogs in 254 don’t do unboxing or review videos. This is surely a good start, the lady handled it well and am sure it will improve with time. Keep it up! Thanks, we are working on making them better. Stay tuned! Thanks Nick. We are getting there. All I can say is that it received a much appreciated facelift resulting in a clean, modern and minimalistic design that looks very pleasing to the eye. But bros, you go sabi grammar well well o. The HiOS and Music experience is what stands the Boom J8 apart, and probably makes it better than its peers. Now that the boom player app is there, trust me…it’s a whole new world. was it ever at a price? the first picture containing all components of the pack… PERFECT. the boom j8 definitely does better than the j7. it’s not even up for argument. If I declare this HiOS ugly now, voltrons will come at me. Reviews like this should be on the Tecno forum o.